High quality dialysis in Switzerland without any personal costs. Packages incl. hotel, transport service, free additional benefits…. You pay nothing for your dialysis. Bring along your National Health Insurance Card, which should have the European back (so it is an European Health Insurance Card) and we will take care of everything. On each dialysis day, you get a gratis voucher for a one course meal in the in-house Chinese restaurant or in the nearby Italian restaurant. Each guest (also your partner) of a hotel or a camping site gets the free Ticino Ticket. It allows you to use for free almost every public transport (trains, buses...) in the whole state of Ticino. Additionally you get 30% discount on many cable cars, 25 % discount on the day passes for the ships on our lakes… It is valid for the complete time of your stay here. Discover Ticino – it has so much to offer! If you want to book a package please call Mrs. Marianne von Ins, Tel: 0041 (0)91 745 15 60 or write a mail info@dialago.ch. We will confirm your dialysis dates and the selected hotel will call you back. So you can discuss directly with the hotel your dates and wishes. Winter on Lake Maggiore is mild and sunny. Temperatures almost never fall below 0° during the day and the lowest rainfall of the whole year is in February. It is wonderful to sit outside on the promenade of Ascona on beautiful days and enjoy a cappuccino in the sun. Spring arrives in March and it blooms in Ticino. For example, the flowering camellia park by the lake is enchanting. The associated event in the park and the exhibition in the Old Town from 27 to 31 March 2019 attract thousands of visitors. But of course it can rain occasionally or the temperatures are such that you don't want to spend the whole day outdoors. 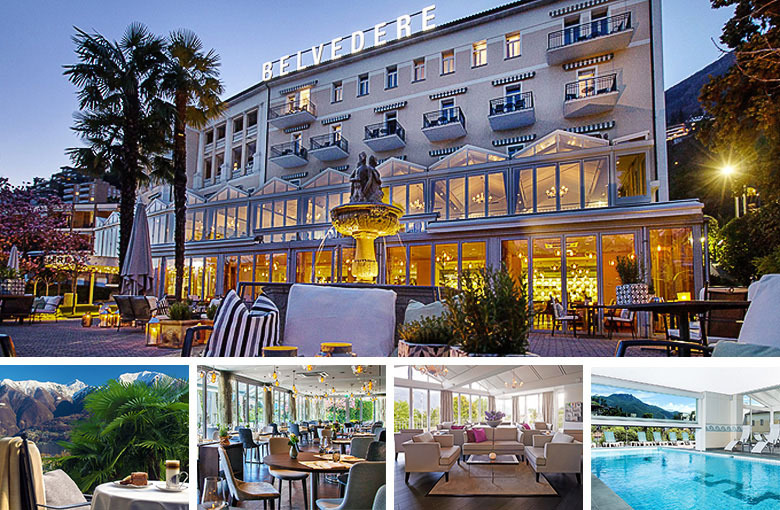 That's why we recommend the 4-Star Superior Hotel Belvedere, Locarno - to the hotel´s website. In this hotel these days are also "feel-good days" with wellness area, sauna, steam bath, laconium, indoor swimming pool, the library with newspapers and the evening menu in the charming restaurant. 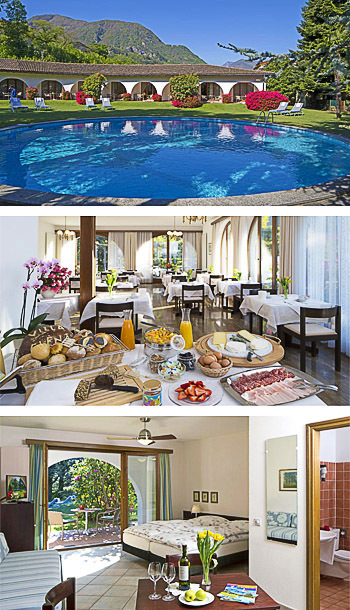 The hotel is located on the hillside above the old town of Locarno and it is a 350 m walk to Piazza Grande. For DiaLago guests the hotel offers special conditions until 16. april 2019.
the Funicolare / cable-car has a stop next to the hotel. It goes to the city of Locarno or to the pilgrimage church Madonna del Sasso, the landmark of Locarno. You will receive 3 free tickets per person. Of course, you and your partner will also receive the above mentioned Ticino ticket for free travel on public transports and the voucher at each dialysis for a plate in the in-house Chinese or nearby Italian restaurant. If required, there is a shuttle service from/to Locarno railway station on arrival and departure. Valid until 16. april 2019. The tourism tax of CHF 6.10 per person per night is charged separately. Parking or garage CHF 13,- per night. The hotels listed below, Garni Elena in Losone, Aparthotel in Locarno, Seeschloss Castello in Ascona, are taking a winter break. They open again in the middle of March 2019 with special conditions for DiaLago holiday guests. The Hotel Belvedere is open all year round. It offers DiaLago holiday guests special conditions both in winter (see offer above) and in summer. If you choose one of these accomodations you also get the gratis voucher for the one course meal. You get also the free Ticino Ticket, but only if you stay in a Swiss hotel or Swiss camping site (not in Italy). The complementary transport is also available - but only if it is mentioned explicitly in our hotel description. Very quiet and sunny position, close to the rivers Maggia and Melezza with beautiful natural beaches and close to the golf course Losone. Distance to Locarno or Ascona approx. 3,5 km. Situated on a beautiful sunny hillside above Locarno with magnificent views of the lake and mountains. You can reach on foot the Piazza Grande of Locarno (about 350 m) and the lake (distance about 700 m). + 6,10 CHF visitors tax per person / night. Parking (if needed) and extras are charged separately. 300 m walk to the town centre of Locarno, situated directly at the lake side. Guests with 65 years or older get a 10 % discount (not available during peak season). In a fantastic location, directly on the idyllic lakeside promenade of Ascona. Please ask for special rates for Superior double rooms and the Medieval Tower rooms.